Welcome to another week, Judges! 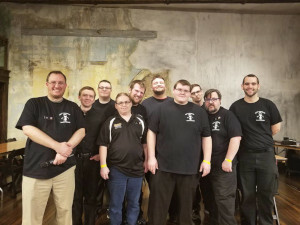 In today’s article we get to know a Judge who has some great tips to share about finding guidance and improving as a Judge in the community. Why did you become a Judge? 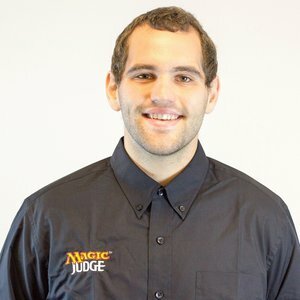 I became a judge after watching my best friend almost get cheated out of a match at a Store Championship. The judge at the store handled the situation phenomenally (and my friend did win), but I still wanted to know more about the game to handle situations like this in the future. Occupation: Program Supervisor at Salomon Farm Park, a fully-operational farm in Fort Wayne that is run by the Parks and Recreation department. We teach the community about gardening, livestock, agriculture, and Hoosier life in the 1930’s. 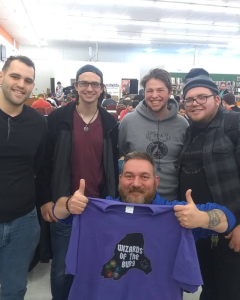 Best tournament result: 3rd at a PPTQ (of 8 players). I was an L1, and I was supposed to judge to get some Comp REL experience in, but only 7 players showed up. The store owner gave me free entry so that she wouldn’t have to refund the players, and I borrowed cards from 2 different people I had never met so that the event would launch. Random fact about yourself: I love the paranormal. I believe in ghosts, cryptids, and more, and would love to hear stories and learn more about anything you have to share. You were nominated for your willingness to actively seek out support and guidance from other Judges. Why do you believe it is important for Judges, especially newer ones, to be able to admit what they don’t know? I have always had a very hard time with this, and not just in judging. For a long time, I was always hesitant to burden others, as I was afraid that my problems weren’t “good enough” for them. However, for me, judging has always been about learning. This was one of the things that I chose to work on and to learn how to overcome. When you talk to other judges, it is obvious how much passion they have for the game and for their work. They want to help, and they want to see others succeed. Talking to these judges and learning from them is not only a great way to make yourself a better judge, but to make them a better judge as well. It keeps them on their toes, ready to support their argument/position, and think through their actions. It takes a lot of courage to admit that you don’t know something. Even L3’s ask for help. It’s ok.
At each event, keep three things in mind. 1.) What can I learn? Being able to take something away from each of your events is critical to becoming a better judge. If you look back on an event and say “Yes, I was there,” then you haven’t really taken anything away from it. Being able to assess ways that you have gotten better from an event will help you to ensure that you are developing your skills, as opposed to staying stagnant. 2.) Have goals. Before any event, I like to make myself a goal. This could be something as simple as talk to every judge I don’t yet know, or more policy based, such as discussing a call you made that you weren’t quite sure about with a few other judges. Giving yourself something to work towards will provide yourself with tasks to complete, whether your on the floor or waiting for the next round to start. 3.) Get to know the other judges. These people are great, and you will only do yourself a favor by getting to know them. You don’t have to be best friends, and you don’t have to hang out on break, but learning someone’s name will make it much easier to ask them to approve an HCE, or to provide a sanity check on a GRV, or offer someone to talk to while you’re out on the floor. My first call at Comp REL was on the floor of an SCG Open. I had only worked FNM’s/Prereleases, so I expected to be on sides all weekend, but I was put on Slips Day 1 of the event. In Round 1, I approach the table with 37 minutes left on the clock, and the player tells me that he believes his decklist is wrong. While sideboarding, he sees that he has 2 copies of Empty the Warrens, but believes he registered 3. 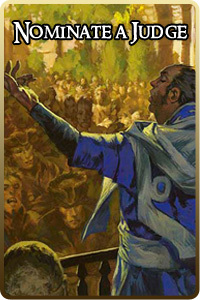 He wondered if it would be more beneficial to himself to alter the decklist to match the deck, or vice versa. I let this player know that I would confer with another judge to make sure I got the issue resolved properly (in reality, I was probably going to make the wrong call, so I needed help). He thanked me, and I grabbed another judge (Zachary DeLadurantaye ). Zach comes back to the table with me to help the player out. They begin talking, and I am asked to go grab the decklist. I get most of the way there, before I realize that I don’t know the players name. So I march back. Zach is still talking to the player, and I didn’t want to interrupt, so I asked the opponent their name, and went off with the match slip. I get to the Deck Checks area, and being Round 1, they are still sorting. They finally find it, and I speed back to the table. Most of the way their, I look at the cards on the list, and see that the decklist I have is for an Abzan deck. I get back to the table, and call out the name on the slip. It’s the player in the seat next to the call I answered. This call ended up with a double Match Loss for Tardiness, plus a Game Loss on the next match for the original call due to a Decklist Problem. I have yet to take a call as difficult and tedious as this. I know significantly more about sandwiches. I have many people that I look up to in the program, but three were fundamental in my growth from an L0 to an L2. Patrick Cobley is the one who took me under his wing, and officially certified me for L1. From him, I learned many of the things a judge needs to run an effective event, including being friendly and inviting, happy to help, and staying positive when under pressure. After certifying for L1, I became more familiar with Marcos Sanchez and David Elden . Marcos was my L2 tester, and from him, I have learned more about taking a step back, analyzing the whole situation, and identifying the root cause of what needs to be addressed. Finally, I have learned so much about rules and policy with David, that I have now joined him on our Twitch stream, Judging FTW, where we discuss rules and policy every other week. I have a lot of really great friends that I get to see every now and then when I hang out at events or conferences, which is such a delight. I find myself to be much more confident as well. Having something that I am measurably good at (judging) has provided me with a more positive self-image, which has helped me to feel more comfortable with myself. When I’m not playing Magic, I love being outdoors. Hiking, camping, backpacking, or paddling are my favorites, but even spending a lazy day in the backyard, drinking tea and watching the dogs run around is a day well spent. When I was in high school, my best friend was teaching his girlfriend how to play at the mall. I happened to run into them, and he invited me to join in. He then taught me how to play, so that I could play against her. Apparently, she was getting upset with him, because he kept winning, so he decided that she would have a fair chance against me. The more I continued to hang out with him, the more I started to enjoy the game. +1: Look at the top card of your library. If it is a creature, you may reveal it and put it into your hand. Otherwise, put that card on the top or bottom of your library. -2: You may destroy up to one target artifact or enchantment. Dalton, Nature’s Retribution deals 2 damage to each opponent. -8: You get an emblem with “Creatures you control gain ‘Whenever this creature enters the battlefield, you may have it deal damage equal to its power to any target.” Then you may put a creature from your hand onto the battlefield. 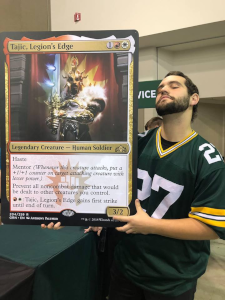 I had a blast at SCG Columbus. It was my first time Team Leading at a large event, and I felt great about my performance. I actually had a few other judges, ones who I look up to, tell me that they thought I did really well. However, one of my L1s worked their first large event on the Sunday of the event, and I got to be on their team and see them crush it on sides. It was probably cooler than the Team Lead, all in all, but I am very proud of both. I love Thalia. If you are unfamiliar with her story, go read her story on the official Magic story page. If you think you know Thalia’s story, go read it on the official Magic story page. Thalia has always fought hard for what she believes in. She refuses to let others get in the way of what she knows to be right (and fortunately, she has a good moral compass). She is not afraid to stand up to others, including her peers, to do what she knows must be done. I hope that I can emulate that same confidence and bravery in my life. I have never eaten chili, due to a strange case of leguminophobia. As a server at Olive Garden, I saved a woman’s life, as she was choking on a breath mint. Her husband didn’t even tip 15%. I am a published author, though I write using a pen name. My preferred genre is horror, but I got my start writing poetry in college for a zine that my friend Pierce created. Natalia has never been so late to a GP that she was dropped from the main event.